Investing real money in your website is an essential ingredient to creating leverage against corporate giants. It’s no secret that big business often dominates small local businesses with their prestige branded reputations, upscale stores (in perfect locations), lower prices, high marketing budgets, battle tested infrastructure and countless others. Investing in your website gives you the opportunity to stand toe to toe and even kick these companies right out of your community. If your website accurately reflects your competitive advantage, is optimized for local search (specifically for mobile devices), and engages with your community – you’re all set. However, if you’re like many other local business owners and neglect your website, you’ll lose. Remember when you first decided to go into business? You probably did so because you thought you could provide a service or solve a problem better than most of what was available to the market. What was it about you that made you different? To be clear, I want to understand your mission. Now, take a look at your website and ask yourself if your website accurately reflects your mission and your competitive advantage. Can you see it? If you answered yes, ask a couple of customers the same question and see if they see it as well. All too often local business owners, don’t put enough thought (and money) on their website. Be sure your site reflects who you are, and if you’ve chosen to go cheap, you’ll notice “cheap” or “same as everyone else” reputation. Large businesses know this and use it to showcase their brand and take the advantage. I know quite a few local business owners who are happy with their website until I show them how it’s hurting their bottom line. If you’re not pulling your hair out from the never ending attention that goes into maintaining + improving your website, then your site is falling behind. If not maintained properly, even an expensive, well designed, optimized website can and will fail. To sum it up, showcase your business mission and competitive advantage on your website and maintain it DAILY! Who is your competition? Use your mobile device and run a quick search of companies in your industry. Who ranks higher in mobile search results? You or them? What search term did you use? And why? What competitive advantage do they have? If you’re not in displayed in the top few spots of your Google/Bing/Yahoo search, I suggest scheduling a free SEO audit with me so that I can offer some insight. I can’t promise to get you listed in the top spot overnight and don’t trust anyone who makes such a claim. Those search engines get you work for it, but I do know some proven techniques to help get you ranking (legally) quicker. Design – Be sure your website is aesthetically pleasing, reflects your competitive advantage, and is easy enough to use so site visitors convert into paying customers. I know many amazing designers to recommend and also have heard great things about 99 Designs – they can get you beautiful designs for very low costs. New Content – Your website must generate new, relevant and consistently good content. IT will help you grow and engage with your followers in the social media communities and boosts your credibility with the search engines. 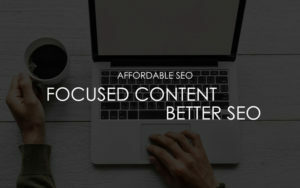 Coming up with content is very hard; however, you can hire writers from services such as Fiverr.com to help you create content for relatively cheap. Paid Ads – This is a good way to jump ahead quickly and get an idea as to how your website is converting, but the goal is to let your organic searches take over. Google Analytics and Maintenance – GA is a free service offered by Google. It can be hard to follow and understand, so this is where you may want to pay a professional to monitor your website analytics. This person will know how to read and report your site’s data and adjust your future investments as needed. It’s important to think of your website as an online version of your entire operation. If you’re having a cashflow problem or need tax advice, it’s in your best interest to hire an accountant. Similarly, if you’re having issues with marketing business/website to your community it’s often a good idea to ask a professional. Maintaining a website is a full-time job, and most smaller local companies simply don’t have the workforce. Remember, investing in your site gives you the best leverage in beating both local competition and corporate giants. Stop being a tight wad and invest in your website properly or your website could be hurting your bottom line. Good luck with your investment and let me know if you’re in need to schedule a FREE SEO audit or talk about how I can help you.